The Sony HDR-UX5 AVCHD DVD Handycam Camcorder shoots in genuine 1080i resolution, for real unparalleled HDTV clarity. Its professional quality Carl Zeiss Vario-Tessar lens captures brilliant images with life like color and tones, while the 2.1-megapixel CMOS processes faster than a CCD for richer color and better detail. The Progressive Shutter System supplies digital still images with excellent definition and sharpness. Equipped with a 10x optical zoom that lets you close-in on your subject with a pure optical quality, and the 80x digital zoom that lets you go all the way out for incredible close-ups. The CMOS sensor has nearly 2.1 effective megapixels that provide incredible clarity. It delivers faster image processing than a CCD, meaning richer color, greater detail, and less glare from objects. You can use the monitor to check wide-angle shots in digital HD. Because it is a hybrid system, you can still see the LCD monitor outside, even on the brightest and most sunny days. With its 211,000 pixels, the pictures are extra clear and rich for easy detailed viewing. 16:9 recording mode uses the full width of its CMOS to capture video in actual widescreen for superior playback on home theater systems and PC monitors. Just click the Widescreen Button and switch effortlessly from 4:3 to 16:9. Simultaneous Photo Recording lets you take a photograph while recording video. High resolution video starts with the finest glass lens appropriate to the camera. The HDR-UX5 has a Carl Zeiss designed lens, a world leader in optical technology. With the most advanced glass composition and the most efficient anti-reflective coatings, this HDV camera captures the sharpest most detailed pictures in the most compact design available. The DR-UX5 is compatible with DVD-R, DVD-RW, DVD+RW and DVD+R Dual Layer disc formats for easy shooting and storing. This advanced version of Sony's SteadyShot system controls an even higher range of shake and vibration frequencies, to achieve an even higher level of smoothness, without degradation of video. The Super NightShot Plus Infrared System lets you capture natural-looking video from distances as great as twenty feet. This hot shoe gives you the option of adding accessories such as lights, flashes, and microphones to the camcorder. These accessories can also communicate and draw power from the camcorder through the Active Interface Shoe. The Memory Stick DUO Media is 1/3 the size of the standard sized Memory Stick media, while offering the same benefits and capabilities. Languages English, Canadian French, Latin American Spanish, Brazilian Portuguese. 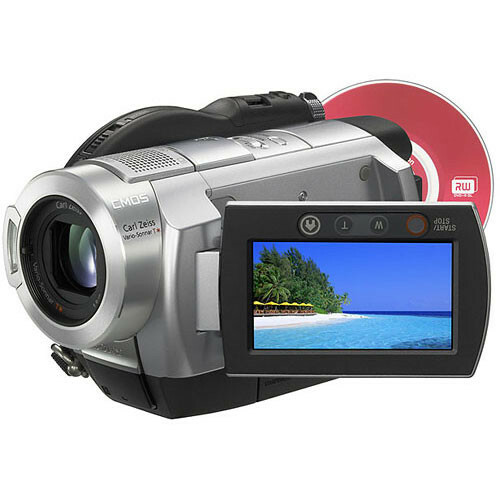 HDR-UX5 AVCHD DVD Handycam Camcorder is rated 4.2 out of 5 by 12. Rated 5 out of 5 by Manny the Geek from Good Buy I bought this to start chronicaling our new child. I played around with it like all boys do with their toys, and I like. For a reasonable price, I have a camcorder with High Definition recording (blu-ray) and regular DVD definition. Touch screen controls are easy. The menus are self explanitory, but if you are confused, check out all the menus. After a once through, everthing seems to make sense. Small, light, well placed controls. Cons: I have found it difficult to delete video clips when using DVD+/-RW disks. Not sure if I am just not doing someting right... yet. Rated 4 out of 5 by Anonymous from Awesome Picture Love the camera, great picture quality, nice features for your basic HD camera. Only problem with camera is an external hook up for a better quality mic. Sony used to make a hot shoe mic adapter , but it's now discontinued. For the average person shooting home videos , it is an excellent cam. Rated 4 out of 5 by Anonymous from Precious Moments in HD forever! The color clarity is so much amazing and so far better than regular DVD video. What's not to love. HD in its simplicity and at the least cost. Although, Sony might want to consider putting a shoulder strap to it just like older camcorders used to have so it would be more comfortable to carry around during tours. Rated 4 out of 5 by Edy Stein from Nice HD entry level camcoder * Mainly used to document the tricks of my new born infant. * Very easy to operate. * Unfortunately in HD the DVD-RW is enough only for 20min rectrding. * Can be used as a 4M dig-cam. Did not use this feature since an extra mem stick is needed. An option to record pics on the DVD is missing. Rated 2 out of 5 by Doc the No Movie Master from A little bit too much work. I am utilizing this camera to capture work practices for traning new employees. Picture is great but still can save information on 3 disk to a dvd disk. System meets requirements listed but thats where it ends. Other camera I had before this one was alot more user download friendly.